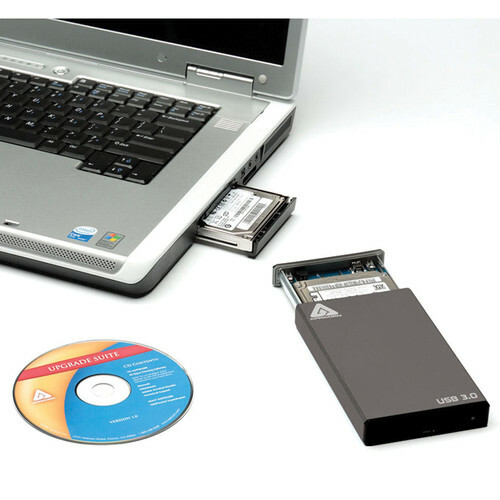 Upgrade a notebook's storage drive by using your hard drive or SSD and the EZ Upgrade 3.0 SATA Notebook Hard Drive Upgrade Kit from Apricorn. This upgrade kit includes an external USB 3.0 enclosure and an Upgrade Suite Software CD that helps you easily upgrade your notebook. Simply install a separately sold 2.5" / 9.5mm SATA hard drive or SSD inside the enclosure and then connect it to your notebook's USB port. After that, you can copy the operating system software, other programs, and files with the included cloning software such as EZ Gig for Windows or ShirtPocket SuperDuper for Mac. Once you have copied the contents from the old drive to the new drive, remove the old drive from the notebook and install the new drive to finish. This enclosure features USB 3.0 technology that provide up to 5 Gb/s data transfer speeds between the notebook and the enclosure, as well as drawing power USB bus power from the notebook to the drive. However, when utilizing a 7,200 rpm hard drive inside the enclosure, you may need to purchase an AC adapter to power the enclosure. After upgrading the storage drive, you can use the older drive in the enclosure as an external USB storage drive. Box Dimensions (LxWxH) 8.3 x 7.5 x 3.2"
EZ Upgrade 3.0 SATA Notebook Hard Drive Upgrade Kit is rated 5.0 out of 5 by 1. Rated 5 out of 5 by Dennis from Apricorn EZ Upgrade 3.0 Notebook Hard Drive Kit I have another copy of this kit. I purchased this one to have a spare. The other kit (same make, model, and as far as I know software), served me well in upgrading a Lenovo Thinkpad T430s from it's smaller 128GB SSD drive to a Sandisk 960GB SSD. As per previous experiences with other Thinkpads I removed the laptop's original drive and put it in the external USB 3.0 enclosure and put the new drive (already formatted) in the Thinkpad. In the past with some Thinkpads running Win XP this was necessary in some cases to get the drive to initialize correctly. After attaching the drive and making sure in the BIOS that the laptop was set to boot from the CD drive I put the included Apricorn Upgrade Suite CD in the CD drive and booted up. Once it booted into the Apricorn Suite I selected the Clone option, made sure I was using the external original drive as the source drive and the internal drive as the destination one. I don't recall all the options but basically I set it to resize the partitions automatically, which it did and also to keep the data on the original drive. I think it resized one of the partitions (it may have been the recovery one) larger than I prefer but with cloning programs the less tinkering the better. Since it's USB 3.0 and there wasn't a lot on the original drive it did the clone pretty quickly. If I'm not mistaken it was less than half an hour. Your time may vary depending on how much data is on your original drive, if there are several partitions, etc. I was very satisfied with the experience. I've had several Apricorn products like this one over the years, none of which ever failed me and all of which performed as expected. I've also used their software suite for more complex tasks. The one with this kit though was more than adequate for my needs. I purchased this kit as it's USB 3.0 whereas my older kits were for USB 2.0. Great hardware and great software. As always swift delivery and great service from B&H. what does my MAC or Windows PC have to have to install the usb 2.0 to 3.0 conversion kit? The included software would be compatible for both PC and Mac.